Richard Woodhams was appointed Principal Oboist of the Philadelphia Orchestra in 1977 by Eugene Ormandy , succeeding his teacher at the Curtis institute, John deLancie, who joined the Orchestra in 1946. Mr. deLancie became Principal upon the retirement of his teacher Marcel Tabuteau in 1954. Tabuteau, widely considered in his lifetime to be one of the most influential musicians in the United States through his playing and teaching at Curtis, became Principal Oboe of the orchestra in 1915 under Leopold Stokowski. Mr. Woodhams is the inheritor of a rich tradition of oboe playing dating back some 125 years when its foremost exponent, Georges Gillet, Tabuteau's teacher, helped develop many of the innovations that are now incorporated worldwide in oboe manufacture. His improvements on the oboe led to greater possibilities of technical brilliance , more flexibility in dynamics and tonal color, and improved response and intonation, and inspired composers such as Strauss, Ravel and Stravinsky to write more challenging orchestral parts for the instrument. Tabuteau's teaching stressed the importance of musical phrasing and the cultivation of a refined but expansive tone quality, with great care taken in clarity of articulation and a shapely musical line, among other concerns. He was acknowledged to possess a strong and sometimes formidable personality, and his presence was considered a large part of the approach to music of the Philadelphia Orchestra, with the influence being felt to this day as part of its' musical DNA. 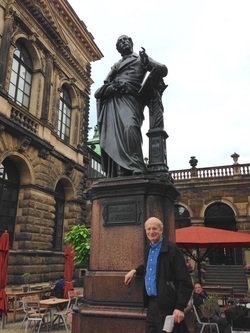 Richard Woodhams has appeared as soloist with the Philadelphia Orchestra in Philadelphia, New York, Boston , Chicago, Los Angeles, San Francisco , and other American cities,as well as in Asia. He recorded the Strauss Oboe Concerto with Wolfgang Sawallisch and has premiered numerous works of chamber music by many contemporary American composers. Long active as a chamber musician as well, he has performed with some of the finest instrumentalists of the past half century. Mr. Woodhams has taught at the Curtis Institute since 1985 and has also been on the Faculty of Temple University.His former students are active and prominent in outstanding musical organizations both in the United States and abroad. He continues to serve as Principal Oboe of the World Orchestra for Peace, an international Assembly of musicians founded by Sir Georg Solti in 1995 to commemorate the 50th Anniversary of the founding of The United Nations. He also has participated in the Music Festivals of Marlboro, Aspen , and La Jolla, among others. He considers his finest playing moments to occur while making music with his peerless colleagues in the Philadelphia Orchestra and marvels at how long this Orchestra has managed to maintain its pre-eminence. During his tenure, his excellent Music Directors have been Eugene Ormandy, Riccardo Muti, Wolfgang Sawallisch, Christoph Eschenbach,Charles Dutoit, and now, Yannick Nezet Seguin. Mr. Woodhams' first teacher on the oboe was the late Raymond Duste, in his native Palo Alto , California, and he began his orchestra career in the Saint Louis Symphony under Walter Susskind in1969. Richard has two grown sons, Louis Woodhams and Eric Woodhams, who live in St. Louis and Detroit respectively, and is married to Kiyoko Takeuti, Pianist and Celesta player with the Philadelphia Orchestra. When he is not concerning himself with some aspect of his art and profession he enjoys reading about culture and politics, hiking, gastronomy, and listening to vintage jazz.